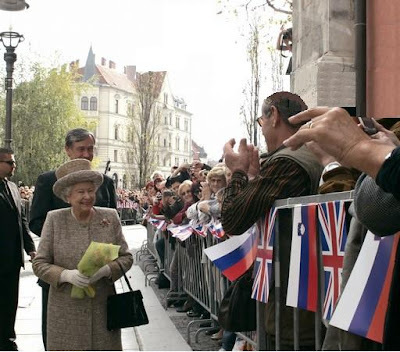 Britain's Queen Elizabeth II and Prince Philip arrived in Ljubljana Tuesday for a two day State Visit to Slovenia. 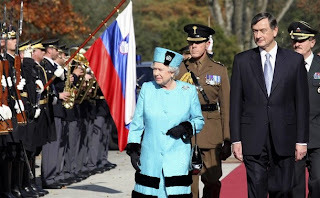 The Queen complimented Slovenia for its striking achievements since gaining independence 17 years ago, in leaving communism behind and becoming a reliable European Union and NATO member. This is her first visit to this country „on the sunny side of the Alps“. 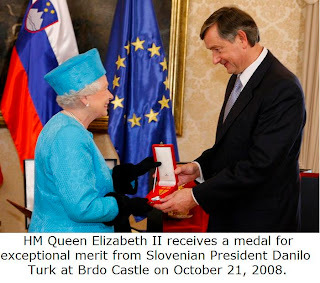 „Slovenia's transformation since 1991 is a remarkable tribute to the country's energy, vision and determination“, the Queen said in her toast to President Danilo Turk at an evening banquet at the Brdo Castle. The visit should „demonstrate the importance the United Kingdom attaches to our relations with Slovenia, as a partner in Europe and an ally in NATO“, the Queen said. The castle was once owned by the Yugoslav royal family and later served as a retreat for Communist dictator Josip Broz Tito, whom the Queen met in the 1970s. Slovenia swiftly adopted Western standards and joined the EU and NATO in 2004. In 2007, it introduced the euro and this year it headed the EU for six months and joined the bloc's borderless zone. Yet its smooth, scandal-free existence, coupled with being one of the smallest EU nations, often leaves it out of the spotlight - and the country welcomes the opportunity to be recognized. 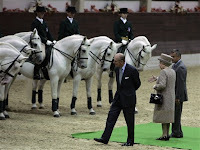 During her visit to this Alpine nation, which Slovenian media called „historic“, Queen Elizabeth II was given a prized Lipizzaner stallion - but she decided to leave him in the care of the Lipica stud farm in western Slovenia. 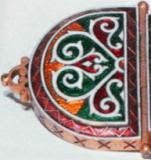 The queen took instant pride in ownership though. „Let me see the stable, she told the stud farm's director, Matjaz Pust, before marching away toward the stall. 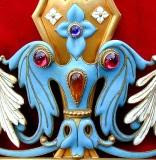 He explained that the stallion's stall had just been renovated, „so he has a royal room now.“ The queen beamed. The tour of the 428-year-old stud farm in Lipica was a high point of the queen's trip to the former Yugoslav republic, which is squeezed between Italy, Austria and Croatia. Later Wednesday, the queen had a lunch with prominent Slovenians at the Castle on a hill overlooking the capital, Ljubljana. She and Prince Philip then took a walk downtown, waving to several hundred people gathered in a central square to see her. The queen planned to leave Thursday morning for Slovakia, another small EU and NATO-member.